The fair, supported by four MPs in Kent, had more than 40 stalls and took place at Maidstone Leisure Centre, at Mote Park, for 16 to 18-year-olds. Craig Jones, sales advisor at Bovis Homes’ Saxons Plain location in West Sussex, said: “We had a tremendous response to our Bovis Homes stall. “Pupils came up to us throughout the day, eager to find out more about housebuilding and the work Bovis Homes does, from construction to sales to customer care. “These are exciting times at Bovis Homes and I’m delighted to work for this company. We wanted to express that to these youngsters, who have their whole career to look forward to. 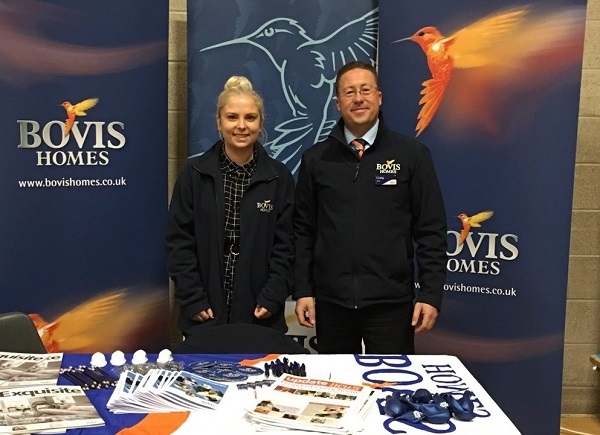 Laura Myatt, group HR assistant at Bovis Homes, also attended the fair and said there was a good mix of both female and male pupils enquiring about opportunities at the housebuilder. MPs Tracey Crouch, Helen Grant, Helen Whately and Tom Tugendhat joined forces to launch the fair, to support more young people into apprenticeships. Bovis Homes colleagues Palvinder Calliste, area sales director, and Darren March, area build manager, also attended the event.